Even before its release, the new colourway if the Jordan Rare Air is already making a lot of noise in the sneaker world after the Jordan Brand revealed its impressive and eye-catching combination of coolers that is massive improvement from its first release. Although the black/red/cement colourway did not hit the strides earlier this year, the latest edition of the Jordan Rare Air is expected to be the best among all colourways with its cool grey upper part, heel, mudguard, and shoes laces. 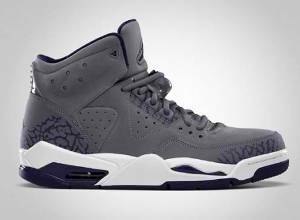 The cool grey color is enhanced with its ink purple accents and white accents, adding a lot of kicks in its design. With its expected success as part of the Jordan Brand Holiday 2010 Collection, you should definitely watch out for it this month and you’ll never regret the decision of buying it.